This was a freely improvised concert with Dave Rempis on alto and tenor saxophone, Elisabeth Harnik on piano and Michael Zerang on percussion, making their first meeting as a trio, although you’d hardly know it by hearing this album. The musicians are listening closely to one another and develop a deeply empathetic relationship. “Wistful 1” opens the album with fluttering sounds and then a siren call of saxophone. With skittering percussion and piano droplets framing him, Rempis’s saxophone moves into darker and fuller territory. The band becomes free and loose, reacting to one another with squalls of saxophone and rolling piano making things very exciting. They go far out on a limb as a howling improvising unit, developing fascinating music. There is an open sounding strummed noise from within the piano lending a mysterious air to “Wistful 2.” Saxophone and percussion probe the nature of the music, which is continuously shifting and hard to get a grip on. Rempis develops low tones of saxophone over subtle percussion, before there is an interlude for piano and cymbals and peals of saxophone, all of which maintain the sense of unease that permeates this track. “Wistful 3” has Michael Zerang’s unaccompanied percussion opening before there is ominous choppy saxophone that is added to the mix. These two instruments sway to and fro very fast and free and developing a very exciting improvised duet. The trio comes together and continues to move together fast and free, rising and descending rapidly in the open space that surrounds them, moving to an off the charts level of thrilling intensity. Rempis opens “Wistful 5” very quietly with the sound of his breath and the clicking and popping of fingered saxophone keys, and light percussion. He moves quickly to a loud, reverberated sound, which is tough and brawling, matched by tumbling drums. Menacing swirling saxophone and rumbling drums make the whole improvisation develop an anxious or skittish quality. “Wistful 6” has lighter toned saxophone and gliding piano making for brighter music, before there is an alarming and unexpected section of strummed strings from inside the piano adds an odd flavor to the music. Rempis retains a softer edge to his playing and Zerang has very fast cymbal playing to close out the section. The music on this album is quite fascinating; it is very free and unfettered and never moves in the way you expect it to. Elisabeth Harnik is particularly fascinating since she uses her whole piano to develop a multitude of sounds that add to the texture of the music. 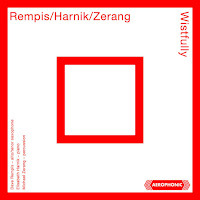 Rempis/Harnik/Zerang - Wistfully - Aerophonic Records.